On behalf of National Nurses United, the nation’s largest union and professional association of registered nurses, representing 185,000 nurses across the United States, including more than 10,000 RNs working at 23 Veterans Administration facilities, I am writing to urge you to oppose the draft legislation prepared by Rep. Cathy McMorris Rodgers that would significantly endanger the health care of millions of veterans by shifting to a privatized system. The duty of registered nurses within the VA healthcare system is to provide high quality care and to advocate for the men and women who put their lives and health at risk defending our nation. Our members are the front-line caregivers whose work ensures that patients get the care they need, and in many cases we are veterans and patients ourselves. 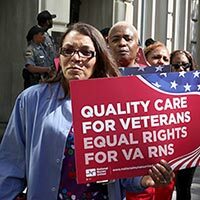 Registered nurses know that the unique healthcare needs of veterans are best met through the VA system, and we oppose diverting VA funds to private health care corporations. Privatization measures, such as Rep. McMorris Rodgers’ proposed bill, would undermine the VA system of care to the detriment of veterans. The draft bill has significant similarities with a draft proposal under consideration by the Commission on Care about which numerous veterans’ service organizations, including Disabled American Veterans, the VFW, and the American Legion, have expressed “grave concerns.” A survey late last year of veterans shows 64% oppose privatization and 80% oppose vouchers (versus continued direct VA care). Provide the VA with the resources and accountability it needs to provide quality care to patients. As you well know, the VA is suffering from a tragic lack of resources that leads to delays in care, it spends resources in ways that do not benefit veterans, it has an insufficient number of bedside nurses, and it does not sufficiently empower front line caregivers to act as patient advocates. Legislation to address these shortfalls is long overdue. Furthermore, improving whistleblower protections will help nurses to ensure that their patients are getting quality, timely care. Reforms like mandatory, minimum nurse-to-patient ratios make high quality care possible and will enable nurses to care for patients to the best of their abilities. Currently registered nurses are often required to care for more patients than is safe; by mandating safe nurse-to-patient standards the VA can dramatically enhance the care veterans receive while keeping nurses at the bedside. Demand full collective bargaining rights for VA nurses. Nurses must be empowered to be patient advocates in a way that they are not today so that they can act to ensure quality care for, and protect veterans who have served their nation. Section 7422 of title 38 of the U.S. code limits the collective bargaining rights of VA professionals, and its interpretation has been broadened over time to restrict the ability of registered nurses to advocate on behalf of their patients and themselves. Nurses need full collective bargaining rights in order to fulfill their critical role as advocates for patient needs and care. We urge you to support HR 2193, introduced by Rep. Mark Takano, to improve patient care, ensure equity among federal health care workers, and enable the VA to recruit and retain a strong health care work force to serve the nation’s veterans. Collective bargaining gives VA nurses the tools to speak up for our veteran patients, which is why veterans groups such as Disabled American Veterans, Paralyzed Veterans of America and Vietnam Veterans of America have supported legislation to modify Section 7422. Our nation cannot send our troops into harm’s way without a full commitment to caring for them when they return home. Registered nurses call on you to oppose dangerous privatization schemes like the one in Rep. McMorris Rodgers’ draft that put care at risk. We urge you instead to fully fund the VA to ensure that our nation’s veterans get prompt, quality health care, and that you pass legislation to empower nurses to advocate for our veteran patients and the care they need.